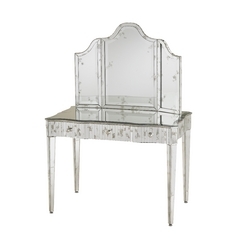 The following are detailed specifications about the Gilda Vanity Arched 36-Inch Mirror. 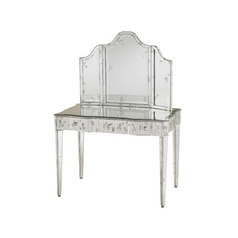 This stunning vanity with an arched mirror is sure to make guests think that it is a treasured family heirloom. Constructed of wood and glass in an opulent silver finish, this gorgeous vanity features three mirror sections that allow you a clear view from all angles. 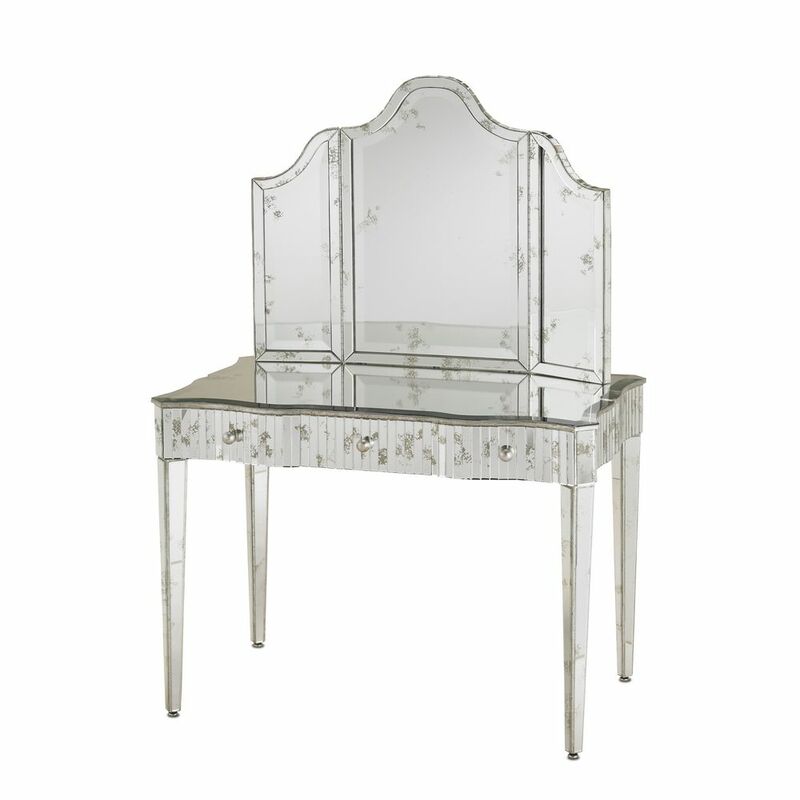 Perfect for the bedroom or bathroom, this vanity boasts an arched mirror to add a touch of traditional style to your home. From Currey and Company Lighting's Gilda Vanity collection, the spacious mirror measures 36-inches wide for simple placement. This oversized product may require common carrier delivery and is not available for expedited shipping. Expect a call from the carrier prior to delivery as you must sign for the order. Currey & Company, known today for its vibrant collection of lighting products, started its existence in 1988 as a purveyor of historic garden furnishings. When Robert B. Currey founded Garden Source Furnishings, the main focus of the company was the creation and marketing of classic garden furniture from the Winterthur Museum and the Smithsonian Institution. These collections were joined by a very American collection of garden whimsies, birdhouses and rustic twig furniture. Some lighting products were among these first offerings and by the early 1990?s the lighting category had become very important. Accordingly, the name of the company was changed to Currey & Company to embrace a new focus on products for the interior. Chandeliers and wall sconces today form a significant part of the company?s business and these goods are characterized by the attention and detailing that goes into their manufacturing and finishing. Currey & Company brings to the marketplace merchandise that not only speaks of the touch of the human hand, but also utilizes a myriad of natural materials. Hand forged iron products have long been the specialty of the company, but the range of materials has been extended to include a variety of materials such as hand-carved wood, porcelain and brass. ?Currey International? has made it possible for the company to develop and produce a variety of unique hand made products and materials. One of these is concrete hand formed to create fashionable furnishings of ?faux bois.? Seashells and other natural materials also figure strongly in the Currey & Company product line. This Gilda Vanity Arched 36-Inch Mirror is part of the Gilda Vanity Collection from Currey and Company Lighting. The following items are also part of the Gilda Vanity Collection.